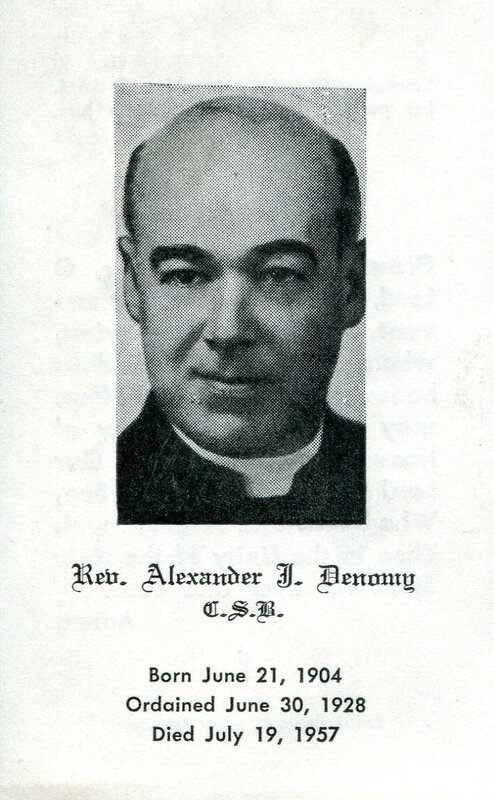 Denomy, Alexander Joseph, priest, was born in Chatham, Ontario (diocese of London), on 21 June 1904, the son of Alexander Denomy and Mary Brisson. He died at North Scituate, Massachusetts, on 19 July 1957, and is buried in the Basilian plot of Holy Cross Cemetery, Thornhill, Ontario. Growing up in Windsor, Alexander Denomy made his high school and college courses at Assumption College and obtained his B.A. from the University of Western Ontario in 1923, graduating at the age of nineteen. He entered St. Basil’s Novitiate in Toronto and was professed on 11 August 1924. 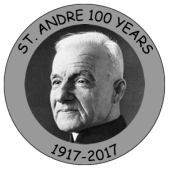 After a year of teaching, 1924-25, at Assumption College and a year of study at the Ontario College of Education, Toronto, 1925-26, he did theological studies at St. Basil’s Scholasticate, Toronto, and was ordained priest on 30 June 1928 in St. Basil’s Church, Toronto, by Archbishop Neil McNeil. In that same year he obtained an M.A. in romance languages from the University of Toronto. After teaching at St. Michael’s College, Toronto, 1928-31, Father Denomy began doctoral studies in mediaeval literature at Harvard University. The chairmain of the Department of French, J.D.M. Ford, wrote to Father Henry Carr on 5 May 1933: ‘In my forty years of service here I have never had any student superior to him in all aspects of the work that he is doing.’ In 1934 he was awarded a Ph.D. for his thesis, ‘An Old French Life of Saint Agnes and Other Vernacular Versions of the Middle Ages,’ with high distinction; and he was awarded a Sheldon Travelling Fellowship, which provided for a postdoctoral year in Europe. In 1935 he was appointed Professor of the History of Comparative Literature in the Institute of Mediaeval Studies, a post he held until his death in 1957. From 1943 to 1956 he was also the editor of the Institute’s journal, Mediaeval Studies. His scholarship drew international recognition. Twice, in 1938 and 1947, he was awarded a Guggenheim Fellowship to consult manuscripts in European libraries. He was appointed to the Advisory Board of Speculum, the journal of the Medieval Academy of America, in 1947. In 1948 he was elected to membership in the Royal Society of Canada, and he became in 1952 a Corresponding Fellow of the Medieval Academy of America. Father Denomy suffered from a heart ailment for many years and was fatally stricken when convalescing in Massachusetts.